Sam’s Club is included in the free Favado app as well as in our Store Deals page here on $5 Dinners! 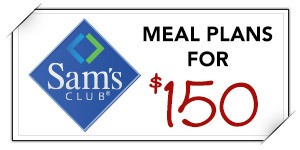 If you are a Sam’s Club shopper, then be sure to check out our 20 Meals at Sam’s Club for $150 meal plans! Click here to see the complete list for Sam’s Club! The box has gotten approx 1/4 of a lbs smaller while the price went up from last year’s version. The one from last year was 105.48 oz and the new one is 101.8 oz, but the piece count has gone from 277 to 290.